Salmon constantly switch up what they key in on. Meanwhile, I’ve been noticing recently they are really focusing more on krill stuff. And, that’s with everything: my Super Baits, eggs and jigs. Krill scent defines our success right now and lately a lot of it is coming on jigs. What I’m trying to imitate with the jig is a squid or a shrimp and what better to add than krill scent to it? 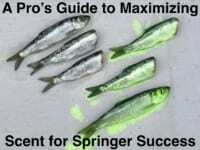 However, adding scent to jigs can be tricky. For years now I’ve tried to figure out how to add krill to marabou and rabbit jigs. I use Liquid Krill often, but that and other liquid based scents can be a challenge because the oils mess the jig up. Oils get into the fibers of the marabou or rabbit and they matt it together. Then you don’t get the free flowing materials that you want and the jig doesn’t work properly. It’s hard to scent a jig with oils. If you put oils and greases around the head of the jig they seep back and it messes with the feathers and matts them up. Then you don’t get the angulation you want. It makes it more like a stick. 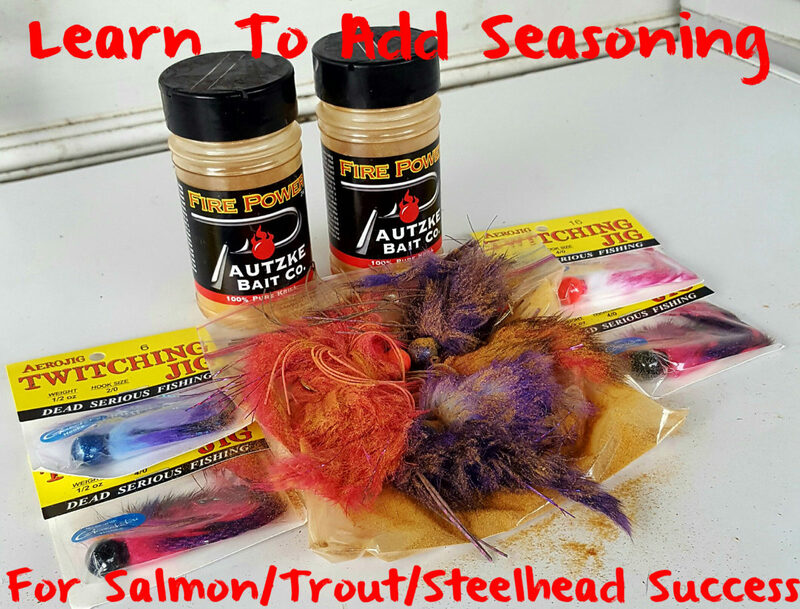 Recently, I’ve found a way to use krill scent without messing with the jig. What I’ve been doing is taking dry jigs, placing them in a plastic bag and shaking Fire Power (100 percent krill powder) in the bag. You need to put a healthy amount of Fire Power and shake it up. The jigs will be encased in Fire Power. I’ll let them sit in the bag for three-to-four days. The Fire Power will soak into the fibers of the material and you don’t have the issues you would get with the oils because it’s dry. You’d think the smell would wash off when it hits the water because it’s a powder, but that’s not the case. I can smell it hours after we’ve fished the jig. It’s true that whatever Fire Power you have on the jig (that’s visible) will wash off when it hits the water. However, the scent from the Fire Power will soak into the fibers and the smell remains. It’s that simple and super easy. I’ve tried Nectar and other scents, but most of them mess with the fibers and restrict their movement. Fire Power doesn’t. How do I know this works so well? When I use fresh jigs out of the package we aren’t getting hit much. I’m noticing the ones with the krill are out-fishing non-scented jigs 5-1. For some reason the salmon are keying in on the krill and many of the other guides are experiencing the same thing. We consult each other often and my peers guiding on the Oregon Coast, throughout Washington and in Idaho are saying the same thing. Krill is the key is success right now. They are more sensitive to krill this year than they’ve been in the past. Editor’s Note: Bob Kratzer operates Anglers Guide Service. For more information on his guided Washington salmon trips please visit www.anglersguideservice.com.